With his new game hitting store shelves today, Kotaku caught up with rapper 50 Cent to chat about Blood on the Sand's silly premise, music sales, and his future plans in the game industry. 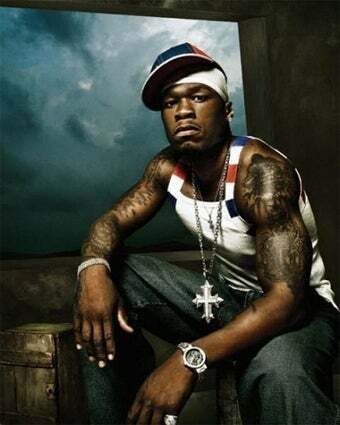 50 Cent: Blood on the Sand is the second game to feature the famous rapper's name and likeness, following up on the multi-million selling 50 Cent: Bulletproof for the PlayStation 2 and Xbox 360. Now 50 and the G-Unit take battle off of the mean streets and into into desert, shooting, driving, and flying their way through a fictional country in order to retrieve his stolen diamond skull. An epic tale of adventure if I'd ever heard one. During the interview, I finally got a chance to ask 50 Cent the question that's been nagging me ever since Blood on the Sand was announced - why the hell did you make a game where rappers shoot up an imaginary Middle Eastern country? "It might be far-fetched, but that's me avoiding you telling me that my game is so graphic that you feel like it will make kids go do stuff that they're not supposed to." 50 is actually addressing the concerns raised by his first game, 50 Cent: Bulletproof, that took place in an urban setting that many felt was too realistic. "If I didn't do what I did conceptually when it came time to create the setting for the game, I would get all these complaints about the game being too aggressive." So in essence, Blood on the Sand's rather strange story and setting are a direct response to criticisms over the last 50 Cent game. He was aiming at making a non-realistic game. Mission accomplished. Before answering the question, however, 50 actually corrected me, telling me that the game didn't actually take place in the Middle East - it just looks like the Middle East. It could be anywhere, really. He pointed out that Blood Diamond, a movie he likes to cite as an inspiration for the game, takes place in Africa, though it certainly looks like the Middle East at times. I just assumed "fictional Middle Eastern country" still indicated the Middle East. 50 Cent doesn't think so. The war setting is not only inspired by movies, but by 50 Cent's own visit to the troops in the non-fictional Iraq. "The intensity of being a part of the war setting...it's probably the most dramatic situation you can actually be in, and people consciously go into that, which is a trip to me." We also asked 50 is the release of games like 50 Cent: Bulletproof and now Blood on the Sand had an effect on the sales of his music. "I do see a change in the response to the actual music. What I've learned is a lot of time they'll turn the television down and play music from another source, because the quality of material that's on the actual game isn't up to standards right now. The opportunity to provide that intensifies the actual experiences. This is why this is perfect to release (the game) prior to the sales of the actual album. When they actually get a chance to hear some of that material, it raises the anticipation of what my next album is going to be because this music has been held to standard." 50 Cent is a pretty big gamer himself at this point. He's got a Nintendo Wii in his office, complete with Wii Fit, an Xbox 360 in his truck, and all three systems at the racquetball room in his house, where his kids play on a 24-foot projection screen. As for what's next for 50 Cent in the games industry? Aside from delving into video game films with Saint's Row, the rapper expresses great interest in creating new games that don't actually feature him as a playable character. "I'm a big fan of Tetris (as mentioned in McWhertor's interview with the G-Unit)...some of the older games...Pac-Man, Ms. Pac-Man, Dig Dug, Centipede...where you only had one joystick and one button. I want to be able to create...not necessarily a different controller and all that...just to be able to create something different." Maybe 50 Cent has a better head for gaming than we first expected?